This week has a theme, and it's A.G. Howard. Some of you may have read my overwhelmingly positive review of Splintered, her fantastically creepy debut novel. Okay, not ghost-story creepy but there's an aspect of eeriness to the flavor she gives Wonderland that really made her retelling special. Not to mention a strong main character, delightfully devilish (and potentially loony) mentor, and the deeper issues of mental illness and belonging gluing it all together. So yes, I'm absolutely dying to read the next one. Right now I'm living on sample chapters from Netgalley and suffering heroin-like cravings for more. Or something like that. 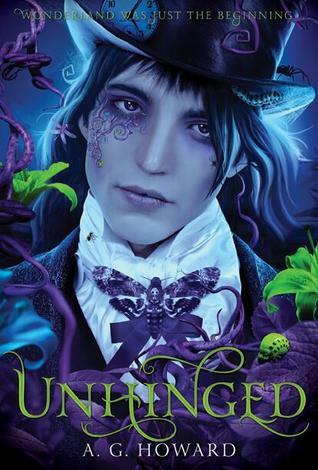 Besides having a beautiful cover, Unhinged promises a lot more madcap adventure and some continuation of the darker stuff that we got from Splintered. If anyone gets an ARC and is willing to share, I will GLADLY pay shipping both ways and eternal gratitude and maybe my firstborn.